Despite being the second largest country in the world, Canada has a small population relative to its giant size. For the most part, the country is rural with the far majority of the population living within a few hours drive of the United States. Canada has some very large cities such as Toronto or Vancouver, but also has some of the most vast wilderness on the planet. I have visited Canada twice, the first time I went to the eastern province of Ontario to visit a friend, and most recently in August of 2007 I went to the western province of British Columbia. 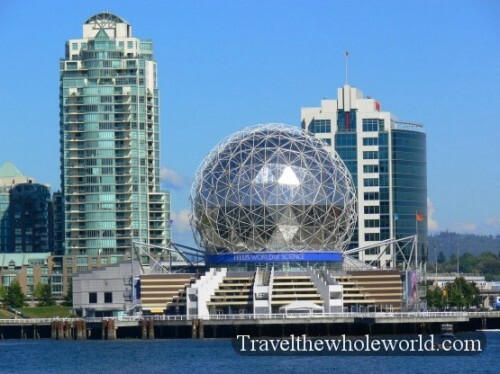 The city of Vancouver is often ranked as one of the best cities in the world to live in. Despite being pretty far north in the continent, the Pacific Ocean keeps the city warm in the winter and because of its high latitude it stays cool in the summer. The surrounding area is very scenic and has lots of activities so you’ll never get bored here. Vancouver is also within a few hours driving distance from Seattle, Washington. Just about the only big downfalls of British Columbia and Vancouver is the frequent rains and overcast. Although the city doesn’t see much snow and never gets uncomfortably hot, days of overcast or rainstorms are very common. 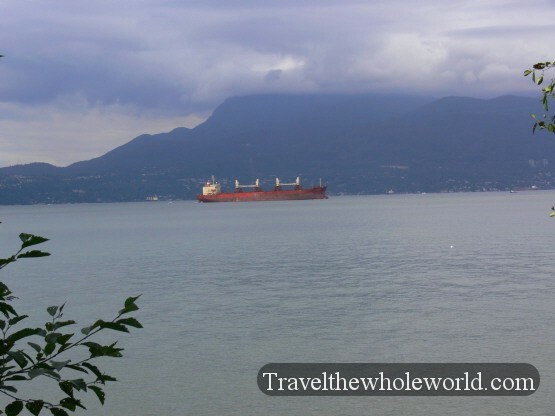 On the left is a ship coming into the cloudy harbor near Vancouver. When the weather clears up then you can see how nice the city really is. On the upper left is the Telus world of Science building. 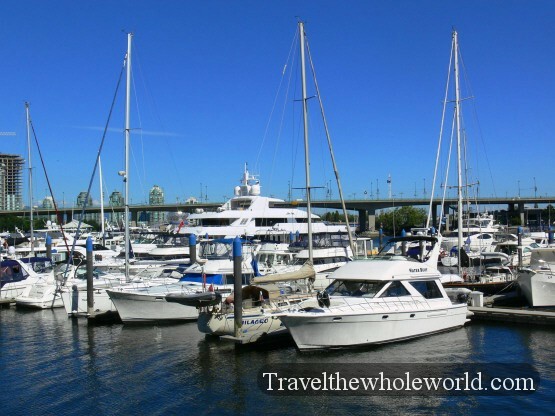 On the right are the yachts in Vancouver’s downtown marina. 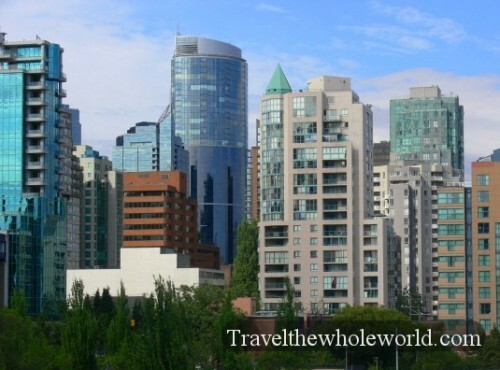 Another one of the reasons that Vancouver is often said to be one of the best cities to live in is because of its reputation for being such a safe city. 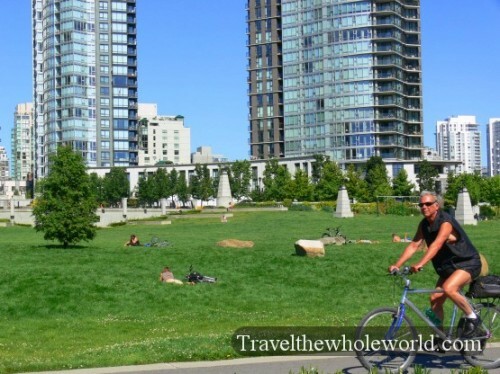 Above is a man meditating on a sunny day, on the upper right is a man riding his bike past a park with people laying out in the sun. These two photos above were taken from a part of downtown Vancouver known as the seawall, which has nice restaurants and a trail for joggers, bikers, and people just going out for a walk. Like all major cities though, Vancouver also has a ghetto which I accidentally walked into. This is a place where people pick fights with shopping carts and walk around half naked. On the right is a lady in the ghetto of Vancouver. 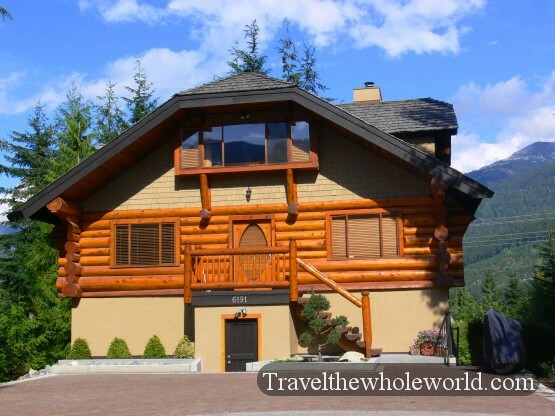 British Columbia and the entire western region of Canada are very scenic and mountainous. 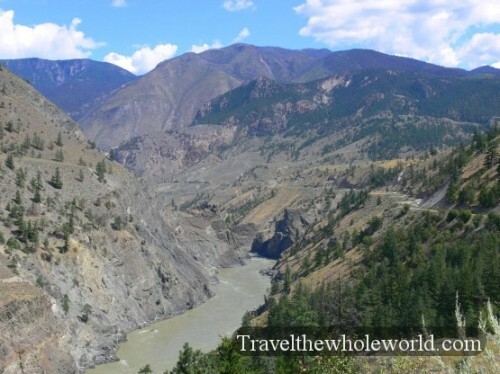 The upper left photo is from Fraser Canyon which is a few hours north east of Vancouver. 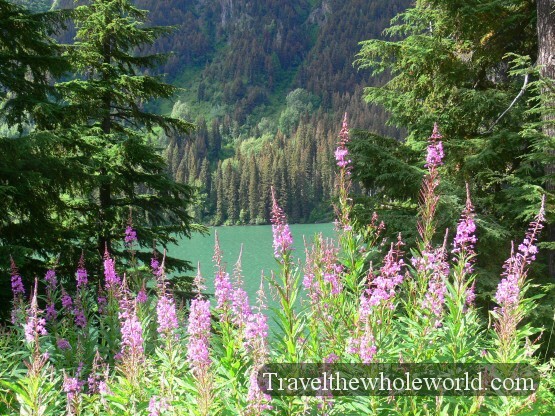 The upper right is a photo of some nice colored flowers, with a small part of a turquoise lake in the background. 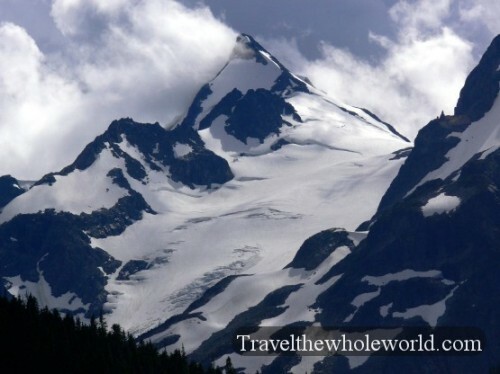 The town of Whistler is surrounded by many mountains that are permanently covered in snow. Because of its easy access from Vancouver and great ski slopes, Whistler was chosen to host the 2010 winter Olympics. 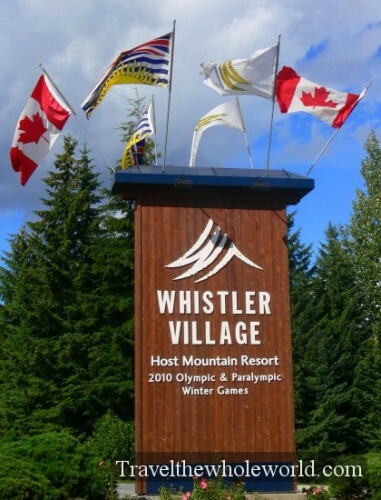 On the left is a sign for the village entrance, on the right is one of the many cabins homes seen around the village. Both the western and central parts of Canada are made of up very large mountains. 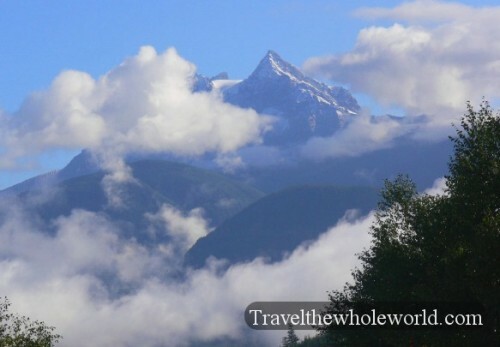 These mountains above are just outside of Vancouver and are part of the Coast Mountains which run up from British Columbia into the Alaskan Panhandle. I made a failed attempt to summit Mt. Garibaldi which is seen on the right due to bad weather. Even though I didn’t reach the summit I still made a page about it, click here to see more about that climb. 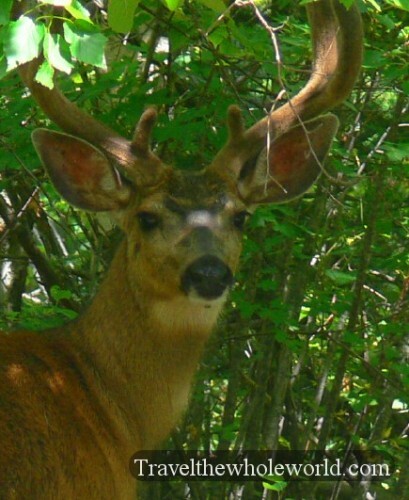 These two animals above are from British Columbia. 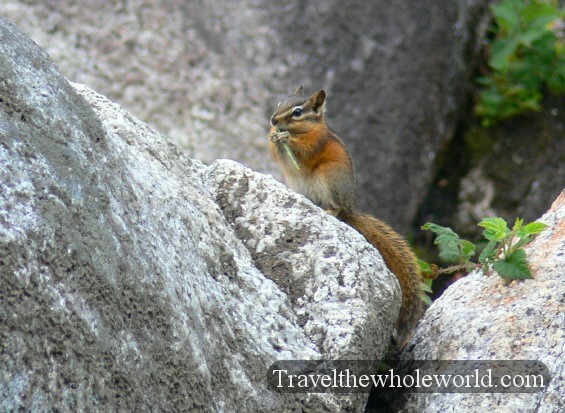 On the left is a young buck, to the right is a chipmunk. 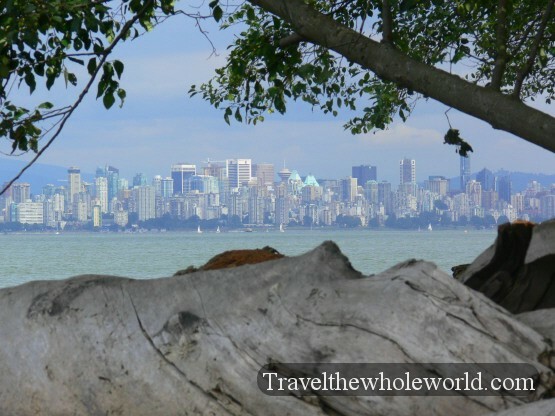 British Columbia and the rest of Canada are known for their large populations of both black and grizzly bears. These last three pictures are from my first trip to Canada back in 2004. 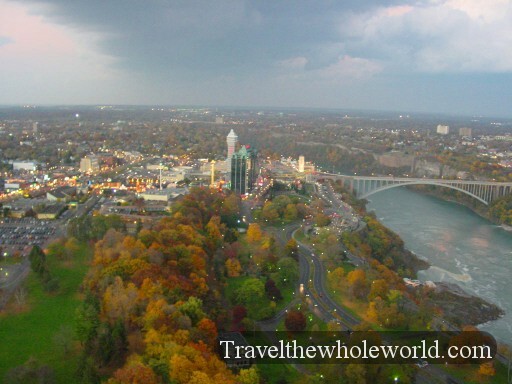 I spent only a few days in Ontario visiting a friend in London and Niagara Falls. On the right is a picture of Niagara Falls City Canada, across the river is actually New York, USA, with that city also known as Niagara Falls. Both cities are very tourist friendly with casinos, small rides, restaurants, and souvenir shops full of T-shirts and other merchandise. The bottom two photos are from the actual falls themselves taken near dusk. 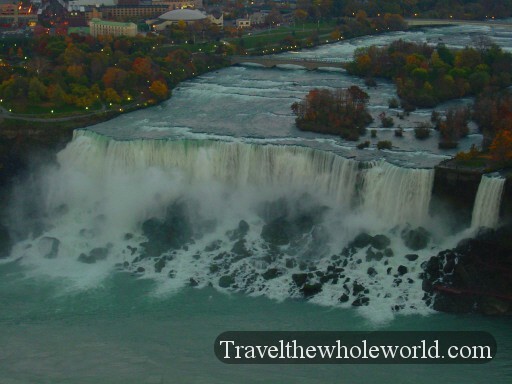 The falls dump millions of cubic feet of water every minute, and are by far North America’s largest waterfalls.